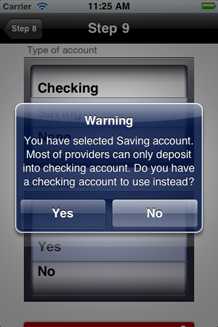 Download application for your mobile and get quick Payday Loan throught your phone. 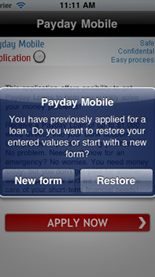 Getting fast and convenient payday loan using your mobile phone has never been easier. 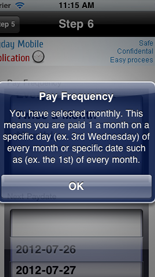 PaydayMobileApp is a free payday advance app that allows you to deal with sudden financial needs, such as gift expenses, health care, car repair or anything else. 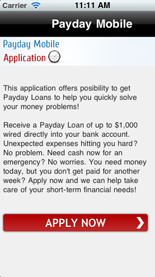 Receive a payday loan of up to $1,000 transferred instantly to your bank account. 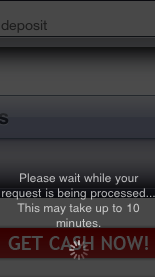 Once you provide us with that information, we can start the approval process which usually takes around 10 minutes. Your credentials are 100% safe, because we use 128bit Secure Socket Layer System in order to encrypt and protect all of the information you send to us. 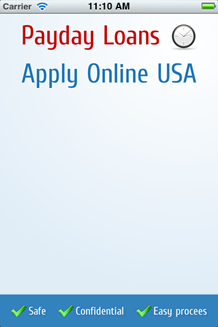 As operator of this application we are not lenders and we do not broker loans and we do not make cash advances or credit decisions. This application will submit the information you provide to lender. 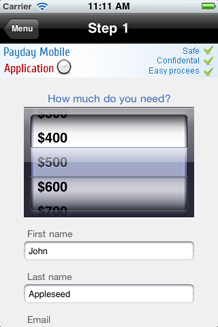 Providing your information in our application does not guarantee that you will be approved for a cash advance.